Soviet reform of the Gregorian calendar was very different from the French reform during the Revolution. While it did not set aside the Gregorian calendar year, the new reform completely restructured the weeks. 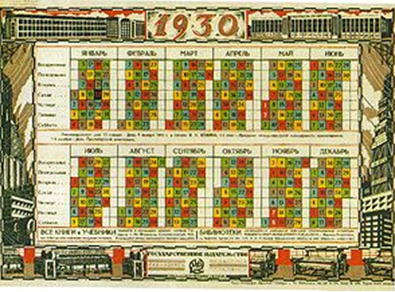 The official reason was for greater productivity from workers and factories, but like the French reform before it, the Soviet calendar reform was in large part a reaction against religion. In May of 1929, Yurii M. Larin proposed a continuous production week.1 While at first his proposal was lightly dismissed, by the very next month he had won the support of Joseph Stalin, premier of the Soviet Union. Any opposition to the proposed reform was quickly crushed as "Counterrevolutionary bureaucratic sabotage." 2Two months later on August 26, 1929, the Council of People's Commissars (CPC) decreed that all productive enterprises were to transition from the traditional work week interrupted by a weekend, to a continuous production week. Further, the CPC stated that it was "essential that the systematically prepared transition of undertakings and institutions to continuous production should begin during the economic year 1929-1930. "3The idea appeared simple: divide all workers into shifts. This applied not only to factory workers, but to retail and government workers as well. With factories and stores open and producing 24 hours a day, every day of the week, productivity would increase. This was called the nepreryvka or "uninterrupted" week. The reform was simple in appearance only. The effect on social life was disastrous. Weeks were five days long. Each day was coded with either a Roman numeral, I to V, or a color. These colors soon came to be identified with certain days of the week. Workers were assigned a number or color to indicate their days off. With such a large segment of the country's population at work on any given day, the result was that it isolated friends, church members and families from each other. If the husband rested every Red day, the wife rested every Blue day and the children were out of school every Green day, there were very few opportunities for socializing together even within the family unit, except after a long day of work. Whether Muslim or Jew, Christian or Atheist, a person's life revolves around his days off work. 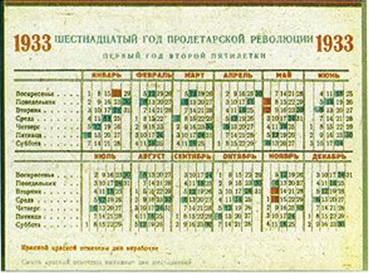 The Soviet calendar experiment was vastly more radical than that of the French. Instead of just changing the number of days in a week, the Soviets basically had society broken up into fifths: one-fifth of society living by one calendar; the second one-fifth living by another, the third by still another, and so on. This fragmented society. Churches, families, society as a whole was no longer a harmonious unit, but was, in a very real sense, five separate societies that lived parallel, rather than intersecting, lives. As a social experiment, it led to a complete breakdown of the family unit. That one would tend to choose one's friends from among those who shared the same days off is quite understandable, particularly given that, on days when workers had a day off, only about 20 percent of the people they knew would be available for socializing, the other 80 percent being at work. The problems inherent to trying to get together with people whose work schedules are essentially out of phase with one's own are obvious. The discontent of the populace soon led to a modification of the calendar reform. On March 16, 1930, the "Government Commission of the Council of Labor and Defense on the Transition of Enterprises and Offices to a Continuous Production Week" acknowledged the need for families to have similar days off and that such requests should be taken into account when assigning work schedules.7The CPC issued a decree on November 23, 1931,8which ended an experiment so destructive to Soviet family/social life.However, this did not restore the traditional seven-day week. 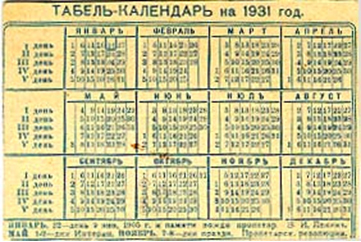 From then until June of 1940, the Soviet Gregorian calendar was divided up into months containing five weeks of six days each, or the chestidnevki. The sixth day was the common day off for everyone. spirit of a spiritless situation. It is the opium of the people. The abolition of religion as the illusory happiness of the people is required for their real happiness. The demand to give up the illusion about its condition is the demand to give up a condition which needs illusions. The calendar reform did not have the production and monetary benefits first envisioned. Not only did machines break down more as there was no time taken off for routine maintenance, but also with workers in the same factory leaving work or returning to work every single day the lack of continuity in the work force contributed to decreasing production but increasing irresponsibility which, in turn, decreased production still further. The official reason given for abandoning the calendar reform was to restore productivity. However, a large contributing factor, although unstated, was the peasant refusal to fully comply. On June 26, 1940, the Presidium of the Supreme Soviet restored the seven-day week. Calendar reform was by no means dead, however. Elsewhere in the world, agitation for a world-wide reform of the Gregorian calendar was growing. 1 The Soviet Union had been on the Gregorian calendar for only 11 years. 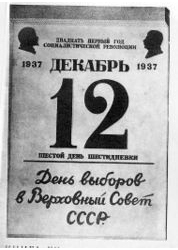 On January 25, 1918, the Council of People's Commissars (CPC) decreed that the Soviet Union would no longer use the Julian calendar but would switch to the Gregorian calendar. This was done February 14, 1918. 2Eviatar Zerubavel, The Seven Day Circle: The History and Meaning of the Week, The University of Chicago Press, 1985, p. 35. 3Solomon M. Schwarz, "The Continuous Working Week in Soviet Russia," International Labour Review, 1931, Vol. 23, pp. 157-180. 4Zerubavel, op cit., p. 37. 5Zerubavel, op cit., p. 38. 6Ibid. See also Lancelot Lawton, "Labour", p. 602 in P. Malevshy-Malevitch (ed. ), Russia U.S.S.R., New York: William Farquhar Payson, 1933; W. E. Moore, Man, Time, and Society, New York: John Wiley & Sons, 1963, p. 122. 7Katherine Atholl, The Conscription of A People, New York: Columbia University Press, 1931, p. 107; Izvestia, March 17, 1930. 8 E. M. Friedman, Russia in Transition, New York: Viking, 1932, p. 262; Albert Parry, "The Soviet Calendar", Journal of Calendar Reform, 1940, Vol. 10, p. 67. 9Zerubavel, op cit., p. 36; P. M. Dubner, "Uninterrupted Week and Labor Productivity," Predpriyatiye 1929, Vol. 73, No. 9, p. 51. 14Zerubavel, op cit., p. 43.